Teeth stains are nearly inevitable. Every day, we consume a variety of foods and drinks (like soda, coffee, dark vegetables, and coffee) that stain our teeth and reverse the whitening effects of toothpaste. However, advanced teeth-whitening technology has enabled dentists to whiten teeth without adversely affecting the tooth structure. At Duff Family Dental, we offer these high-quality products and services so you can achieve a more brilliant white smile. Most whitening methods are similar in concept, but some are obviously more effective. For example, over-the-counter methods are often too weak to produce your desired results or too concentrated – and therefore unsafe to ingest. Whitening strips may only whiten your front teeth, leaving your back molars stained. Plus, using over-the-counter whiteners can give you uneven results that won’t last as long as professional methods. The professional teeth-whitening methods you receive at your dentist’s office are more controlled and effective. In most cases, it can be worth the extra cost for longer-lasting, safer results. The two main methods of professional whitening are tray whitening and in-office whitening. Both of these methods will remove organic stains or discolorations primarily caused by aging, tobacco use, and consumption of certain foods or beverages. Tray whitening involves custom-made, plastic trays that you take home and wear two to three hours a day or overnight. With this method, you will get safe, even results in three to six weeks. First, your dentist will take an impression of your teeth and make a custom tray for you. Then, he or she will give you a supply of whitening gel to take home and use. It’s that simple! During this process, you may develop sensitive teeth. It’s a normal yet often temporary side effect. 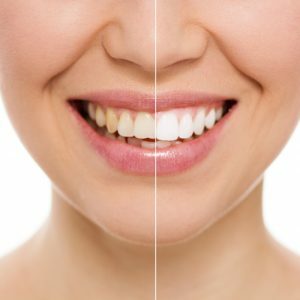 Tray whitening is a great option for individuals who want to take control of the process and who prefer a more gradual whitening. In-office whitening is the quickest, most efficient means of teeth whitening. It involves a relatively high concentration of bleaching gel that provides you with results that are visible immediately. This gel is professionally applied by your dentist and carefully monitored during the application process to allow for a safe, pain-free experience. Plus, the procedure can be completed in a single doctor’s visit! Gum and tooth sensitivity are still possible with this option, but may be less likely to occur. This is due to the use of thicker peroxide gels and desensitizers like potassium nitrate and fluoride (source). In-office whitening is a great option for individuals who want immediate, long-lasting results. Your dentist can give you more detailed information and help you decide which method is better suited to you and your teeth. If you have any questions about teeth whitening or cosmetic dentistry and you live in or around Springfield, Missouri, give us a call today at 417-501-8601 or schedule an appointment online! At Duff Family Dental, we aim to provide you and your family with the best and latest in dental technology and treatment options. We offer a variety of services, including cosmetic dentistry, Veneers, Invisalign, and more. Our knowledgeable staff will work with you to choose the teeth-whitening treatment that works best for your smile.